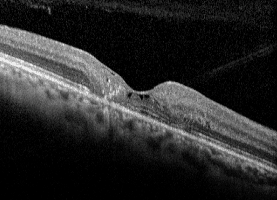 A 54 year-old female was referred to Illinois Retina Associates for decreased vision and macular changes in both eyes. Her visual symptoms had been present for 5 years, but progressively worsening. She had no past ocular history. She was known for back pain and elbow epicondylitis and taking the following medication: gabapentin, naproxen, alprazolam, fluoxetine. 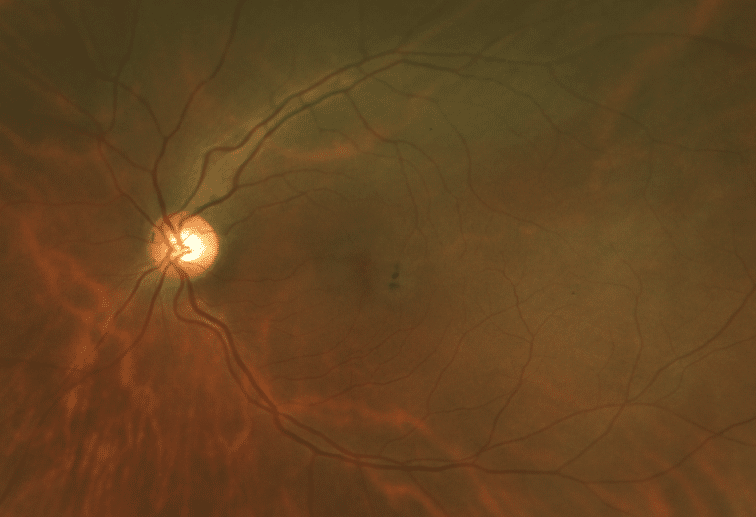 Her uncorrected visual acuity was 20/50 in the right eye, and 20/100 in the left eye, not improved with pinhold. Anterior segment examination showed nuclear sclerosis in both eyes. On posterior segment examination, there was a gray appearance and pigment mottling in the temporal part of the macula in both eyes and the loss of foveal reflex (Figures 1 & 2). On fundus autofluorescence imaging, there was increased autofluorescence in the foveal region of each macula and focal hypoautofluorescence corresponding to the pigment mottling (Figures 3 & 4). 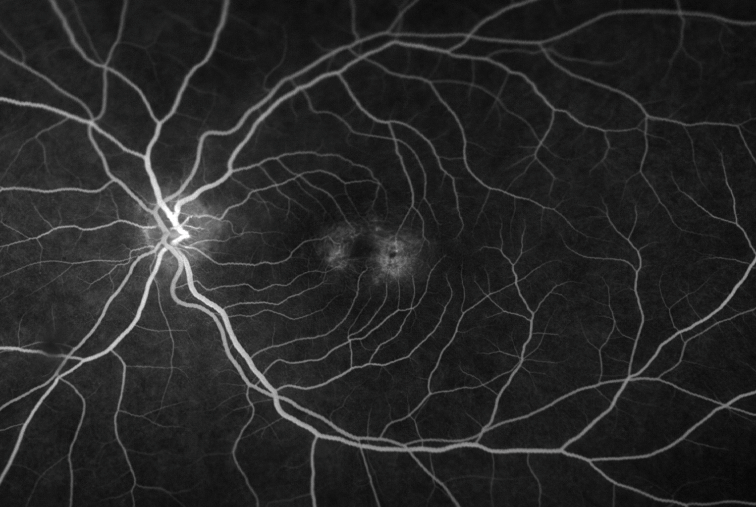 Fluroescein angiography showed hyperfluorescence due to leaking telangiectatic vessels around the fovea, more on the temporal side (Figures 5 & 6). 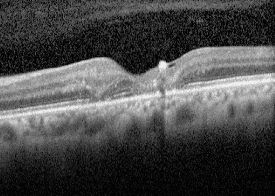 Optical coherence tomographyt showed small foveal cystoid cavities, disorganized retinal layers on the temporal side, and pigment migration into the retina (Figures 7 & 8). 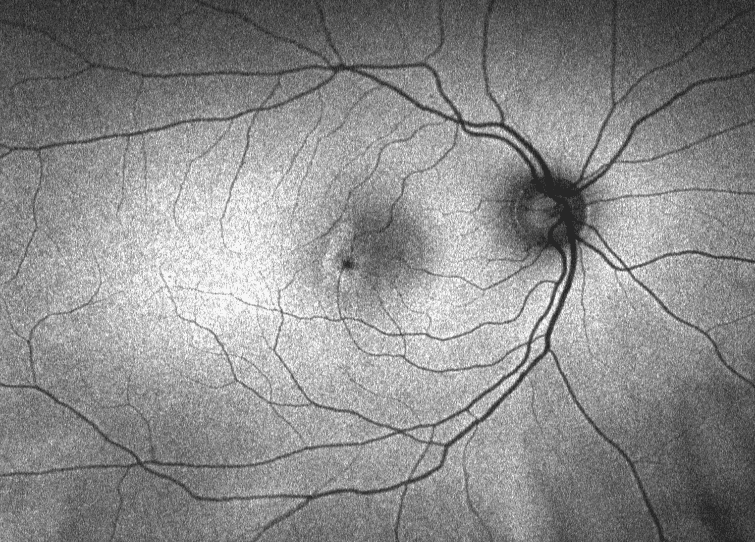 Macular telagiectasis, also called idiopathic juxtafoveal telangiectasis, is typically subdivided into 3 subtypes, depending on their presentation. Type 1 is unilateral and is associated with parafoveal capillary dilation, microaneurysms and lipid exudation. Type 2 is the most common, is bilateral, and does not present with lipid. Type 3 is very rare and is characterized by parafovea ischemia. Macular telangiectasis type 2 most commonly presents in middle age, has no gender nor racial predilection and is not inherited. Commmon complaints include blurry vision, distortion and scotomas. 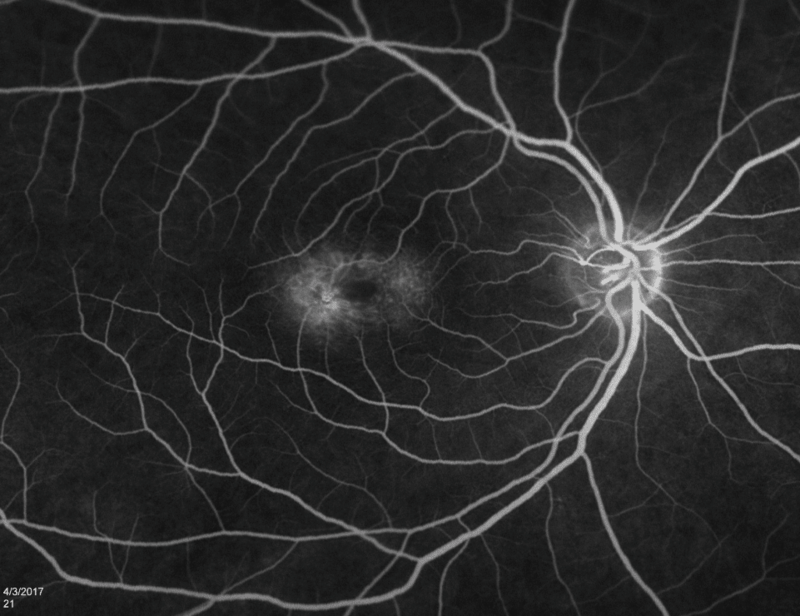 Imaging studies, including autofluorescence, fluorescein angiography and OCT can be helpful in making the diagnosis early, when findings may be subtle. Some early findings include graying of the retina, telangiectasias, crystalline deposits, right-angle venules and cystoid spaces. Patients are at risk of developing subretinal neovascularization with a subsequent rapid decrease in vision. 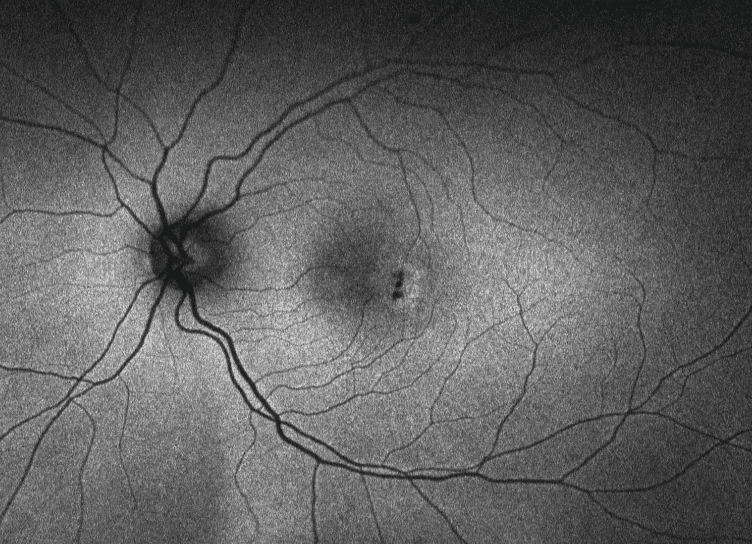 There is no proven treatment for the nonproliferative stage, but once neovascularization is present, it may respond well to anti-VEGF injections. 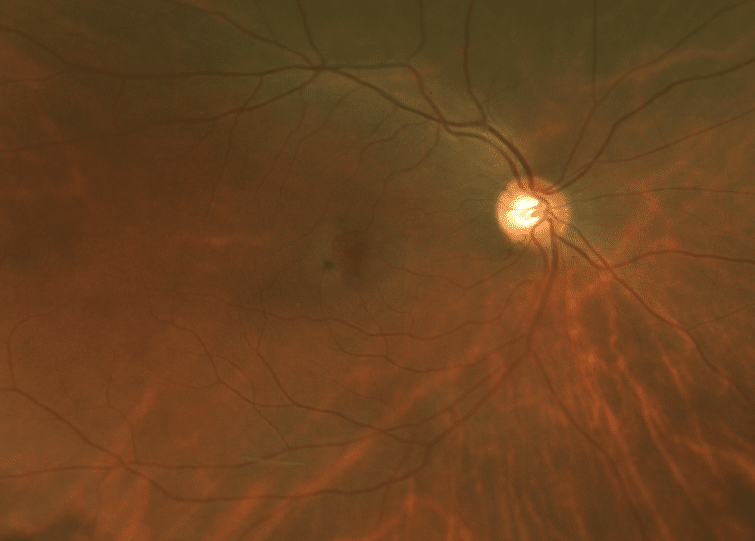 The disease tends to have a slowly progressive course in the majority of patients, with visual loss over time.